Somewhere in the atom-splitting genre distinctions that music critics like to confer, it got lost that pop can be punk and punk can be exuberant. The same music that the kids are blindly thrashing to at post-midnight club gigs can provide equally joyful companionship during a springtime after-work stroll. 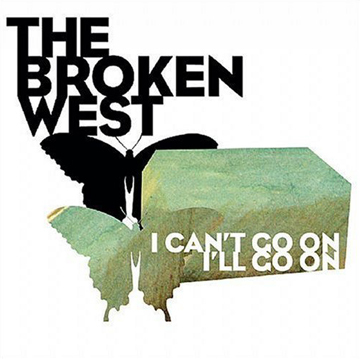 I Can�t Go On, I�ll Go On is the Merge Records debut full-length from the L.A.-based quintet The Broken West, and it arrives just in time to welcome (we hope) warm-weather, sundown time, when people want to feel fired up and relaxed all at once. The disc offers the kind of dramatic, buzz-drenched noise that delivers little raptures throughout. �Every day brings a new doubt / Are we OK, or are we in trouble?� frets singer, guitarist, and co-songwriter Ross Flournoy, in the slap-happy opener �On The Bubble.� It soon becomes clear that Flournoy and company have trapped the agitated euphoria of new romance within their brash but sweet three-chord sights. Judging by the way that The Broken West layers its vocals, guitar, and Scott Claasen�s rhythm-keyboard lines in Neapolitan layers of creamy, melodic choruses, the boys here have been listening to Spoon. There are ominous instrumental noodlings, as in �Shiftee,� but they�re no less infectious. The finale, �Like a Light,� pulls off that acoustic-ballad-to-symphonic-scream trick by never committing to one plot line of despair. �You�ll never know how bright I burn� pines Flournoy as the instrumentation flips from delicate to dense and back. I Can�t Go On, I�ll Go On confirms that some heartbreaks are worth the wait.